Snake chain lenght 40,0 cm with bolt ring lock, a light pleasant wearing silver necklace for the women and men. The snake chain was made from solid 925 sterling silver - silver wire in a special technique produced. The surface is highly polished, light pleasant wearing silver necklace for the women and men. Snake chain lenght 45,0 cm with bolt ring lock, a light pleasant wearing silver necklace for the women and men. Snake chain lenght 50,0 cm with bolt ring lock, a light pleasant wearing silver necklace for the women and men. Snake chain lenght 55,0 cm with bolt ring lock, a light pleasant wearing silver necklace for the women and men. Snake chain lenght 60,0 cm with bolt ring lock, a light pleasant wearing silver necklace for the women and men. Snake chain lenght 65,0 cm with bolt ring lock, a light pleasant wearing silver necklace for the women and men. Snake chain lenght 70,0 cm with bolt ring lock, a light pleasant wearing silver necklace for the women and men. Snake chain lenght 75,0 cm with bolt ring lock, a light pleasant wearing silver necklace for the women and men. Snake chain lenght 80,0 cm with bolt ring lock, a light pleasant wearing silver necklace for the women and men. Snake chain lenght 85,0 cm with bolt ring lock, a light pleasant wearing silver necklace for the women and men. Snake chain lenght 90,0 cm with bolt ring lock, a light pleasant wearing silver necklace for the women and men. Snake chain lenght 95,0 cm with bolt ring lock, a light pleasant wearing silver necklace for the women and men. Snake chain lenght 100,0 cm with bolt ring lock, a light pleasant wearing silver necklace for the women and men. Snake chain lenght 105,0 cm with bolt ring lock, a light pleasant wearing silver necklace for the women and men. Snake chain lenght 110,0 cm with bolt ring lock, a light pleasant wearing silver necklace for the women and men. 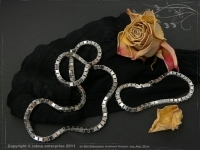 Snake chain lenght 115,0 cm with bolt ring lock, a light pleasant wearing silver necklace for the women and men. Snake chain lenght 120,0 cm with bolt ring lock, a light pleasant wearing silver necklace for the women and men.